The importance of the cult of Saint Philomena is evident not only from the official Church documents, but also from the personal devotions that Popes that have had towards our Martyr. Nearly all the Popes, from 1802 to 1940, have shown a great veneration for Saint Philomena (fig. 18). Some of them have visited the Sanctuary of the Saint when they were Cardinals of The Holy Roman Church. Pius IX, apart from having been miraculously cured by the Saint and spreading her devotion in the diocese of Imola of which he was Pastor, as a Pope he visited the Sanctuary in Mugnano to venerate the sacred body of Philomena the martyr. The devotion of the Popes toward our martyr was great, as shown by their many recognitions, privileges and ex voto. It follows below, beside their names, the period of their pontificate. a – Pius VII (1800-1823). He accomplished the greatest act, donating to Mugnano the body of Saint Philomena. As previously mentioned, the finding of the martyr’s body occurred on the 25th of May 1802, the second year of his pontificate. It was not easy for a priest or even a bishop to obtain the body of a martyr, especially if the name was known. Mons. Bartolomeo De Cesare, new Bishop of Potenza, expressed to the High Pontiff the desire and the zeal of Don Francesco De Lucia: Pius VII was moved and donated the body of Saint Philomena. b – Leo XII (1823-1829). On the 7th of December 1827, he received from Mons. Filippo Ludovici the second edition of Relazione Istorica (Historic Relations) from Don Francesco De Lucia: The Pontiff, who had already heard from different places the echo of the miracles performed by Saint Philomena, wanted immediately to look through the book, and, full of admiration, he exclaimed: “She is a great Saint!”. c – Gregory XVI (1831-1846). Because of his decrees, promulgated with the greatest caution, he can be considered the Pope that most promoted the cult of Saint Philomena. It is with his decree of 1837 that the re-script of the Congregation of Rites of 1834 was solemnly confirmed. The Pope himself wanted to donate to the Sanctuary of Saint Philomena a precious medallion with his effigy, a big silver lamp with golden decorations and a golden chalice, which are kept in the Sanctuary Treasury. d – Pius IX (1846-1878). He was a great devotee of Saint Philomena. This devotion began even before he was ordained priest, which is when he was cured from his epilepsy by the intercession of our Saint. When he was Bishop of Imola, even his secretary, Don Joseph Stella, was cured in 1834 by intercession of Saint Philomena. At the same time, the day in which the Oratorians displayed to public veneration a picture of Saint Philomena on the main altar of their Church, he decided to celebrate in person the Holy Mass. When he became Pope, at his own expense, he helped a poor young man to become a priest; he was called Palmieri and had been cured by Saint Philomena. Struck by cholera, he had been left blind and was miraculously cured by the Saint on the 11th of August 1849. Afterwards, in front of the great urn of Saint Philomena, he expressed the desire to become a priest. 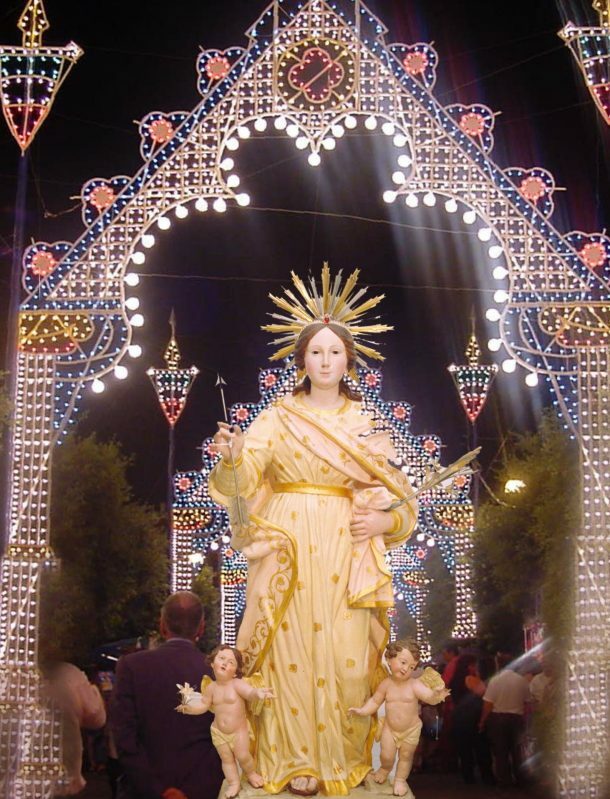 During his stay in the Royal Palace of Portici, Pius IX, accompanied by Ferdinand II of Bourbon and the royal family, on November 7, 1849 came in pilgrimage to the Sanctuary of Mugnano, where he celebrated the Mass at the altar of Saint Philomena (fig. 19). Amongst the liturgical privileges granted by him and described in chapter V, we certainly must remember the concession of its own Office with Mass, a rare honor. A few weeks before his death, the Pope sent to Mugnano the Superior of the Holy Spirit, to donate to the Saint the splendid chalice that the Confederation of the Catholic Clubs of Belgium had donated to him in occasion of his 50th episcopacy (August 24, 1877). The chalice is kept in the Sanctuary Treasury. e – Leo XIII (1878-1903). He came in pilgrimage to the Sanctuary of Mugnano when he was still Archbishop of Benevento. The Pontiff of the great social encyclicals, the sociologist Pope, as he was known, never forgot the Saint of Mugnano. According to the testimony of the Abbot Petit, director of the Work of Saint Philomena in Paris, who was more than once received in audience, every time that somebody mentioned Saint Philomena, the face of Leo XIII would break into a sweet smile. On December 15, 1883, Leo XIII approved the use of a red and white cord in honor of the Saint. Furthermore, on September 24, 1889 he granted the title of Archconfraternity (solely to France) to the Work of Saint Philomena, and in 1902 he wanted to celebrate in Rome, in Priscilla’s Catacombs, the first centenary for the finding of the saint martyr’s body. Furthermore, he sent two gifts to the Sanctuary in Mugnano: in 1888 a nice pastoral and on the May 25, 1902, on the centenary of the finding of the relics, a wonderful missal. These gifts are kept in the Sanctuary Treasury. f – St Pius X (1903-1914). He is the Pope that in 1905 proclaimed Blessed the Curate of Ars, on the first centenary of the translation of Saint Philomena’s Body from Rome to Mugnano. The pope wanted to participate from afar in our feast. On the 8th of August, three days before the celebrations in Mugnano, he instructed P. Remer, a fervent devotee of Saint Philomena, to bring to our Sanctuary one of his golden rings to offer to Saint Philomena. On this occasion Mons. Agnello Renzullo, Bishop of Nola, authorized the papal delegate to open the urn, and he slipped the precious ring on the finger of the wax effigy that contains the Saint’s bones. “Ah, Saint Philomena! I am very saddened by what is written regarding this topic. How can they possibly write these things?”. And he vigorously displayed his sorrow and disappointment, regarding the “Philomena Question”, in these terms: “How come they do not realize that the big argument in favor of the cult of Saint Philomena is the curate of Ars? Through her, in her name, thanks to her intercession, he has received countless graces, continuous prodigies. His devotion towards her was very well known by everybody, he continuously recommended her […]. It is ascertained, it is clear by now that the soul that formed these sacred remains was a pure and saintly soul that the Church has declared of a virgin and martyr. This soul has been so loved by God, has been so appreciated by the Holy Spirit, that it has obtained the most marvellous graces for those that recurred to her intercession […]”. The Pope spoke with ardent conviction. We admire his veneration and confidence for Saint Philomena. Saint Pius X, on the May 21, 1912, extended to the whole Church the Archconfraternity of Saint Philomena: the highest tribute from a pope who became Saint to a great Saint! g – Benedict XV (1914-1922) and Pius XI (1922-1939). There are no detailed records about the devotion towards Saint Philomena by the Popes after Pius X (fig. 20). Looking through the ex voto present in the Treasury of the Sanctuary, however, the names of Benedict XV and Pius IX do stand out. The first one gifted the Sanctuary a “silver Lamb for peace”, the second a golden chalice. Fig. 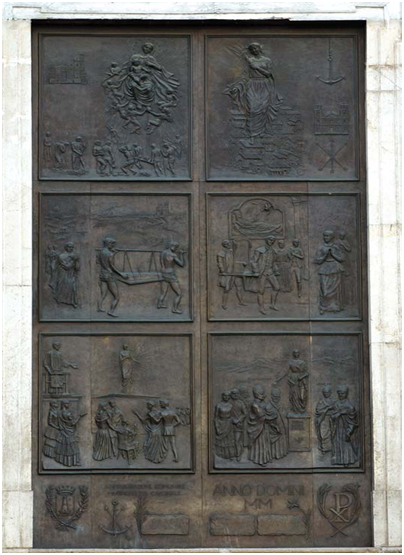 18 – The bronze portal of the Sanctuary of Saint Philomena in Mugnano, work of the sculptor Guglielmo Savini. 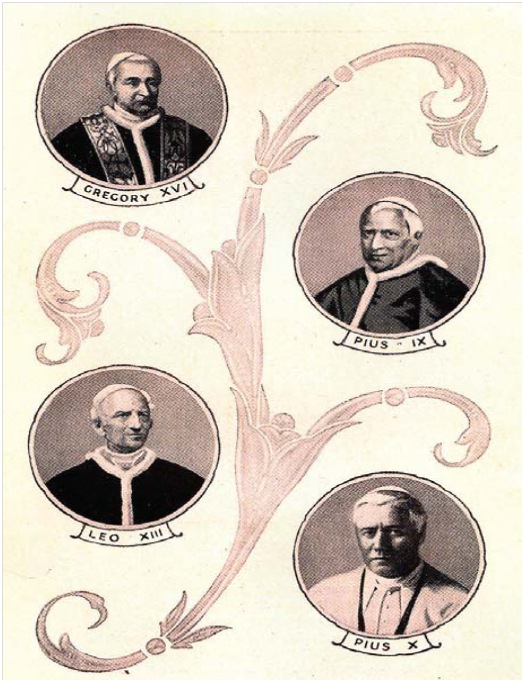 At the bottom are represented the High Pontiffs who have favoured the great propagation of the cult of our Saint. Fig. 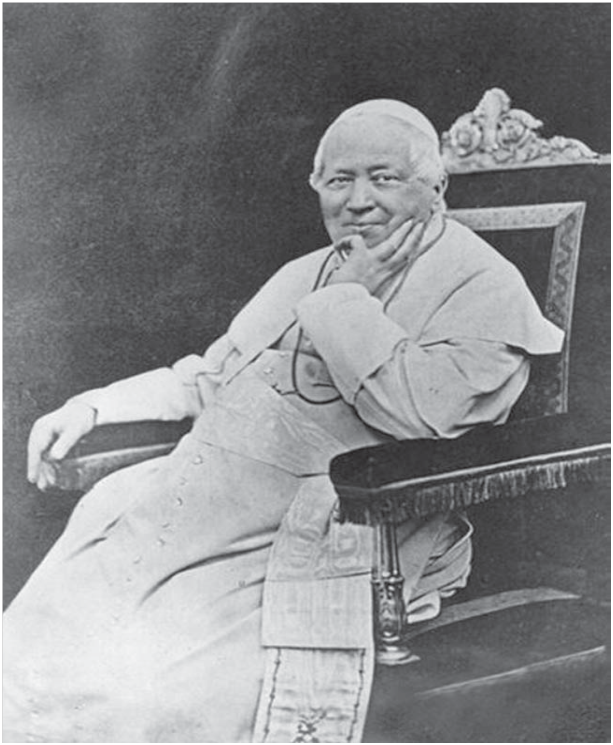 19 – Pope Pius IX. On November 7, 1849, accompanied by King Ferdinand II of Bourbon and the Royal Family, he came in pilgrimage to the Sanctuary of Mugnano del Cardinale, where he celebrated the Holy Mass at the altar of Saint Philomena. Fig. 20 – Some of the Popes who were devoted to Saint Philomena and were propagators of her cult.